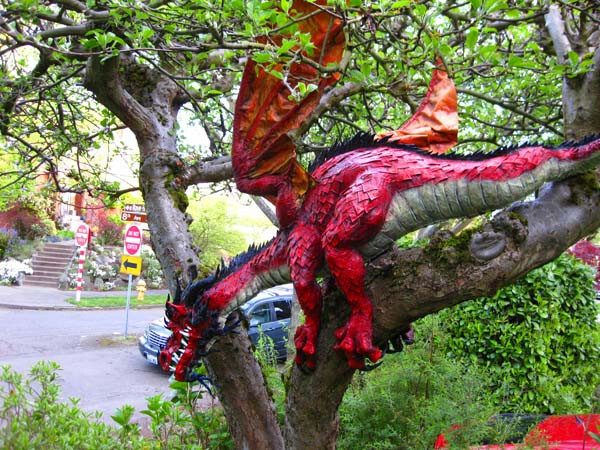 I have been asked for years to make paper mache sculptures that could stay outside. 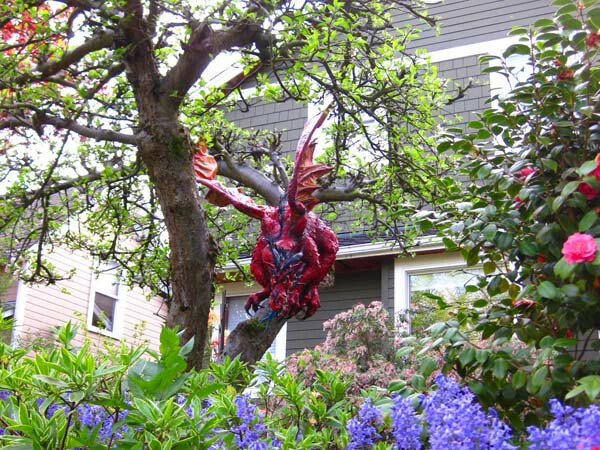 In fact, weatherproofing paper mache is kind of a holy grail of paper mache artists. Many have tried. Many have failed. I’ve made feeble attempts in the past. By that I mean I’ve just put a few things outside for a while to see how long they would last. They didn’t last long. The thing is, newspaper absorbs moisture. That’s why we use it after all. But this time I’ve made something that just might be the answer. 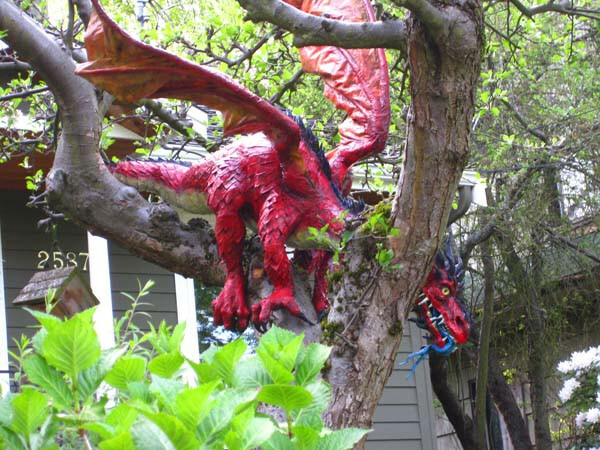 This paper mache dragon is my most recent experiment. 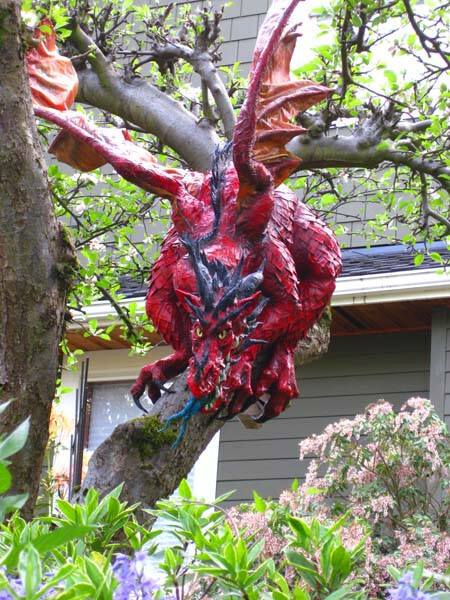 I have put it in the apple tree in my front yard. I’ve watched it for more than four years now. It has withstood Seattle weather without any deterioration. I’m surprised. 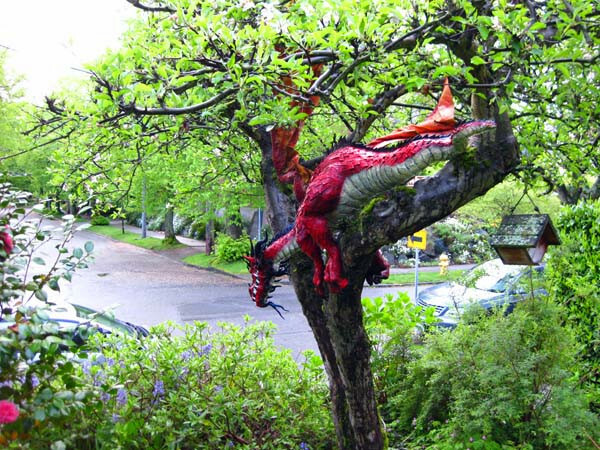 The thing is, he has become a landmark on Queen Anne Hill where I live. Every kid knows my dragon. He has to last now. I’m not ready to declare success. But I’m very optimistic. I’m willing to say that the process I used describe will last at least 5 years. So what did I do? I used “exterior” grade wood glue instead of flour and water paste for the initial paper mache stage. Then I used the same glue for the “cloth mache” skin. Then I painted the project with exterior grade paints. Some people have tried sealants. I have too. I don’t like them. They change the paint. The clear layer takes away any subtlety in the color. Who wants something that lasts forever if it looks bad?